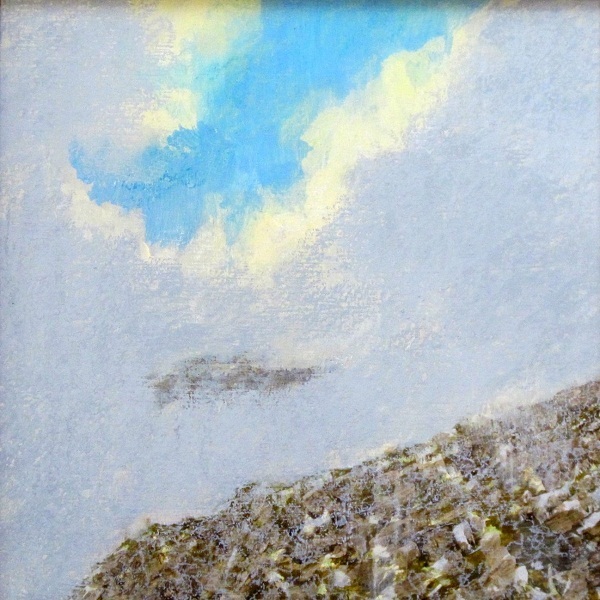 This is a recent small acrylic and pastel painting based on a day a few years ago when we walked Beinn Odhar ….a 900 m hill just to the north of Tyndrum in the Southern Highlands. It is only a short walk to the top ….even I can get there and back in just over four hours, but this is not the point. It is particularly steep and so is a good short work out ….and is one that offers great views. Well, it does if the cloud is not down. On the day that this painting is based on, we started off in damp grey weather and with the cloud well down on the hill. Indeed, all the way up the steep slopes to the summit we saw nothing. However as we reached the summit we noticed that it had become lighter and although we sat there eating our lunch in mist, we did have the feeling that not too far above our heads the sun was shining. Sadly it didn’t clear while we were at the top …a real shame as the views are extensive, but as we started to descend the first few hundred feet of steep rock strewn ground, we saw a big break appearing in the cloud. As we watched the break led to blue sky and we had a glimpse of the hill on the other side of the glen …just sticking out of the cloud. After a short while the cloud lifted completely and we were suddenly in bright sun with the higher mountains around clearing too. By the time we were down to the car the sky was completely blue …what a transformation. << Previous Post: A quick tour of the studio….